Here are four entrepreneurial stories that will surely inspire you. Entrepreneurship is a hot topic these days. Countless articles and books have been written about it, entire university curricula have been built upon its precepts and success stories touting billionnaires who went from “zero to hero” infiltrate our newsfeeds and status updates. Furthermore, entrepreneurship is no longer reserved for those with primary inventions and enough courage to risk their entire savings on an innovative idea. Rather, it has become the “right”—to a degree—for those of us fortunate enough to have been plopped into an environment that can sustain our entrepreneurial ideas. In developed countries, there are supportive government policies, access to capital, and technological infrastructure. So, starting a business in those nations is just as viable as pursuing a more traditional profession. This isn't the case across the globe. Several months ago, the team at Qualcomm Wireless Reach asked me to join them in the Philippines and Malaysia to visit some of their current projects in conjunction with Hapinoy and the Cherie Blair Foundation for Women, where they are utilizing mobile technology to train, launch, and sustain entrepreneurs. Having just attended the Dell Women’s Entrepreneur Network conference in Berlin the timing didn’t work from my end, but I was fascinated by this concept of “what entrepreneurship means to me” —having just spent time with over 200 entrepreneurs from across the globe. 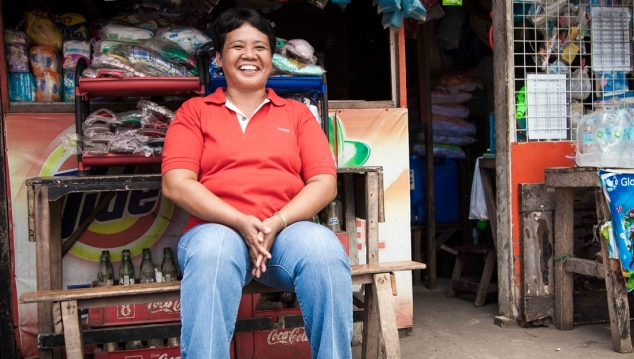 From a woman who survived the Philippines’ Typhoon Yolanda after losing her brother and 17 grandchildren to a single mother who is supporting two children on less than P5,000 a month, these stories are a gentle reminder that at the heart of entrepreneurship—no matter where you come from—is the idea that financial pursuit is not the only goal. Rather, it’s how we choose to pursue our goals despite what we do or don’t have, the lessons we learn in the process and the people we positively influence along the way. When Alicia Dumdum's husband retired 15 years ago, she began to rely on her sari sari, or convenience, store for income. Two years ago, Typhoon Yolanda destroyed her home and store taking more than 20 family members as well. Dumdum rebuilt and through the use of mobile technology, she now generates revenue by offering mobile money transactions to her community.